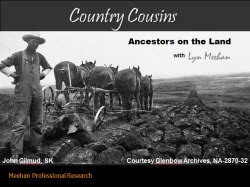 "Country Cousins: Ancestors on the Land"
Many genealogists discover ancestors who were homesteaders, stockmen, laborers or tradesmen living and working on the countryside. Exploring rural ancestors and the world in which they lived requires pinpointing small communities and legal land descriptions. Join Lyn as she shows you how to combine federal, provincial and municipal records to trace your kinfolk.